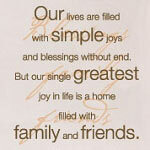 We offer many famous inspirational vinyl wall quotes and vinyl sayings for your home or office. 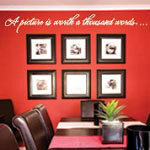 Easily transform your space by accenting a blank wall or complimenting a photo collection with a famous quote or family saying. 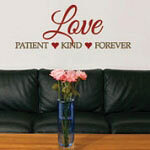 Whether you want a daily reminder on your wall, or a favorite vinyl wall saying that has special meaning ... we can help. Choose from our wide selection of removable inspirational quotes or vinyl wall quotes shown below, or contact our professional design team for help creating any poem, text or word grouping that's special to you. 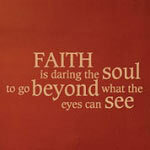 We all have a favorite quote that means something to us and our journey through life. 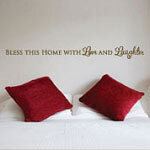 Adding a scripture or famous vinyl saying to your wall helps to serve as a daily reminder in your home. 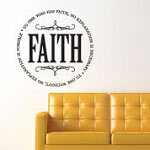 Whether you're interested in family wall quotes that capture your values as a unit, or religious vinyl wall quotes as daily reminders your faith, vinyl wall quotes for bathroom or kitchen — Right On The Walls can create custom wall decals just for you! When looking for that something extra to add more meaning to your walls, consider adding a favorite wall quote or vinyl saying to accompany pictures, framed paintings, above doorways, or incorporated with other decorations. 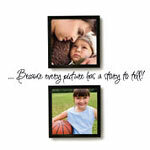 Vinyl wall art can easily be cut to apply in tight spaces, or customized to any shape or size to fit. 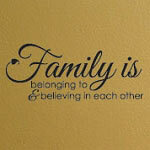 When decorating with our removable wall decals, the addition of living room wall quotes, or entryway stickers can personalize your home and make it more inviting to guests, while showing off your family personality at the same time. 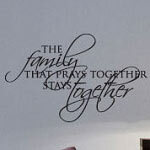 Mix your last name in script with a family quote, or add the first names of each member to your walls including birth date and/or time under individual photos. 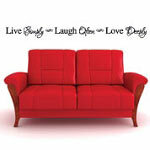 There are unlimited ways to customize your home. 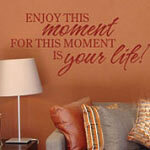 Our wall stickers are made with high-quality matte vinyl that is sturdy, yet thin and flexible. The material is easy to apply, with minimal time and effort. We supply the squeegee free of charge. Wall quotes are a super easy DIY project, you'll have them installed in no time and can start admiring your handy work & the amazing transformation within minutes!